The MUN Qatar group has enjoyed an action packed two days since our first posting. Wednesday morning we visited the Museum of Islamic Art on the Doha waterfront, the Corniche. Kristine’s picture (posted below) of the magnificent architecture of the grounds and building says more than I can easily describe in words. The art pieces exhibited span fourteen centuries from all countries of the Middle East. The sense of antiquity as one wanders through millennia is palpable and humbling.The visiting exhibition is Qajar Women, Images of Women in Nineteenth Century Iran, a graceful and informative exhibit. We could have spent many more productive hours here, but an overnight trip to the Khor Al Adaid (Inland Sea) desert was our next adventure departing early Wednesday afternoon. Getting to the Inland Sea provided the contrast of a 1 hour traffic jam and a 5 minute camel ride; how we wish those time frames were reversed! Then we enjoyed, or endured, 45 minutes of dune bashing in the 4WD Toyota Landcruisers we were travelling in. Our drivers deflated the air pressure in the vehicle tires to better drive through the desert; up and down dunes, and along the side of the sand mountains. In between the dune bashing we were able to admire the vast and desolate landscape stretching to Saudi Arabia, and watch the sun set in an orb of hazy fire. Our desert campsite was beautifully situated on the shoreline of the Persian Gulf, and Wednesday night we were the only guests at this canvas resort created to accommodate up to 150 campers. In fact campsite is a bit of a misnomer as the facility featured 24-hour generated power, a dining lounge, portapotties, artificial lighting and a shoe stealing dog. Thursday morning featured a magnificent sunrise over the Persian Gulf, more dune bashing and a glimpse of the vast oil and natural gas facilities that fund Qatar. 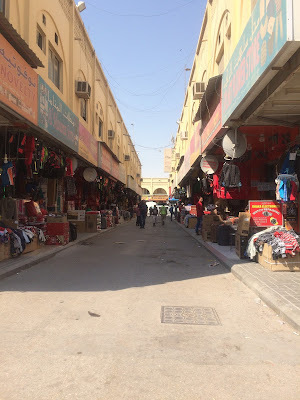 After the early morning return to our Doha Hotel we quickly changed out of sandy clothing and were transported to Qatar’s industrial areas; a clean zone and a polluted zone. Our leader was Mr Uday Rosario the assistant director of student activities at Georgetown’s Doha campus. In his spare time Uday is a labor activist and he wasted no time in describing the abuse of the hundreds of thousands of migrant laborers who are building Qatar’s infrastructure and providing labor across the spectrum of undesirable work. Uday described the network of human trafficking that lures migrants from very specific nationalities to the work camps of Qatar. It is a sordid story that Uday describes as more abusive than represented as it combines the practices of slavery and apartheid. We were able to see (from the outside) the concrete camps that accommodate up to 10 men per room, and we visited a market place where these men spend what little money is left after funds are repatriated to families at home. It was very sobering to see that these work camps were built in both the clean and polluted zones of the industrial area. We are staying in the opulence of a Doha hotel. It was very disturbing to see and hear about the legal and illegal abuse of hundreds of thousands of men in order to support the glitz that is Doha. After another quick change of clothing we were off to the conference opening ceremony and committee sessions. The conference is located inside the vast and lavishly decorated Qatar National Convention Center (QNCC). As we debate disarmament and security questions, environmental topics, human rights and all the other pressing contemporary concerns, I wonder if we will remember who built the QNCC? More to come before we return on Monday.